What a delight to receive an email from one of my former students, Brad Drury, who was a member of the Babson College Class of 1987. 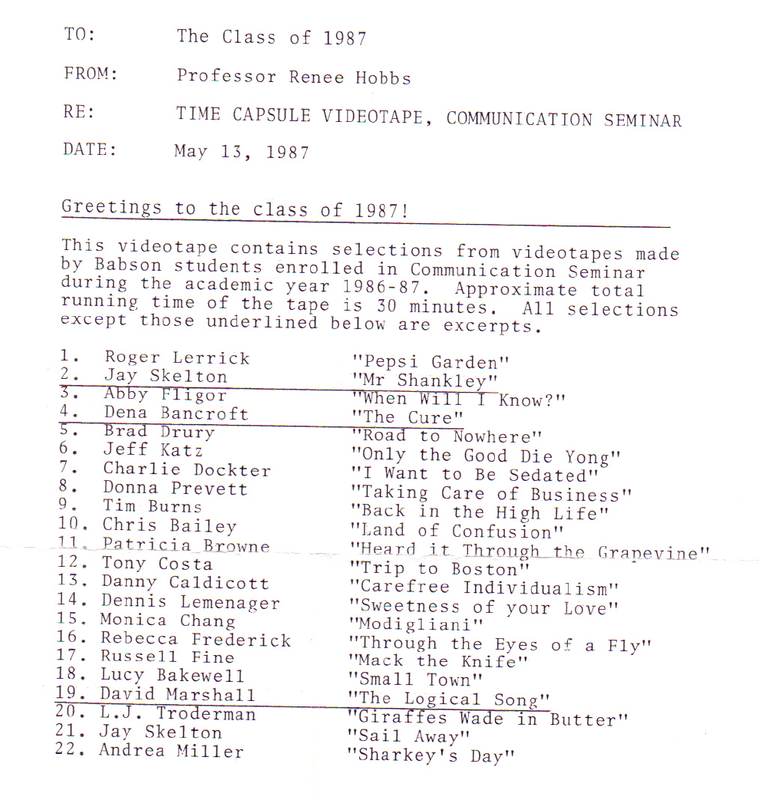 In preparation for the 25th Reunion, he’s just unearthed the “time capsule” that the class compiled and found the videotape I shared with the class, a compilation excerpt tape of 22 music videos produced by students enrolled in Communication Seminar in the Fall of 1986 and Spring of 1987. I was in my second year of teaching at Babson College and although we were in a seminar course that focused on the impact of media and technology on society (reading Amusing Ourselves to Death as I recall), we were simultaneously exploring characteristics of image-sound relationships and examining how to use the new technology of video for purposes of expression and communication. I have the fondest memories of these former students, including Andrea Miller, Jay Skelton, David Marshall, Tona Costa, Abby Fligor, Dena Bancroft, Roger Lerrick, Monica Chang, Russell Fine, Lucy Bakewell, LJ Troderman, Rebecca Frederick, Tim Burns and others. If any of you have (somehow) pack-ratted away your old course notebooks, writing or other assignments from the Fall 1986 or Spring 1987 semester, it’s time to digitize and share them so that the ol’ professor can take her walk down memory lane!